Following residency, Dr. Khanna was accepted for a Fellowship in Rhinology – Advanced Endoscopic Sinus Surgery at the California Sinus Institute in Palo Alto, CA, under Drs. Winston Vaughan and Karen Fong. While training at the Institute, he learned both the medical and surgical management of challenging sinonasal disorders. Revision endoscopic sinus surgery, balloon sinuplasty, medial orbital wall decompression, CSF leak repair, sinonasal polyp surgery, sinonasal tumor removal, and frontal sinus surgery were some of the nearly 300 sinonasal procedures performed by Dr. Khanna at the California Sinus Institute. 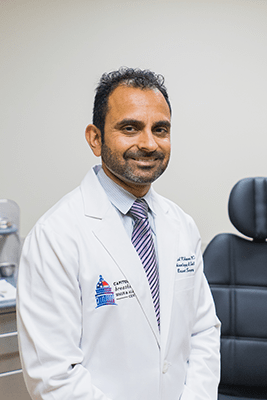 Dr. Khanna completed his Fellowship in Rhinology and Board Certification in Otolaryngology – Head and Neck Surgery in 2008 and returned to the DC metro area to provide quality medical and surgical care for Ear Nose & Throat patients. He served as director of the Sinus Institute of Northern Virginia from 2008 until 2018. He is currently on staff at Harborside Surgery Center and Sibley Memorial Hospital.